The allegation that not just Israel but Hamas as well committed massive war crimes underpins Amnesty’s “balanced” indictment of both sides. Amnesty’s accusations that Hamas was guilty of “flagrant violations of international law”—that is, war crimes—fall under two heads: (1) its use of inherently indiscriminate weapons, and (2) its indiscriminate or deliberate targeting of Israeli civilians and civilian objects. In addition, Amnesty accuses Hamas of having violated the rule of international law requiring it to take all feasible precautions to protect civilians during combat. Each of these will be analyzed in turn.In “Strangling Necks,” Amnesty also accuses Hamas of having committed “war crimes” in its “torture” and “summary, extrajudicial executions” of “at least 23” alleged collaborators in Gaza. Because the focus of this monograph is Amnesty’s treatment of interactions between Israel and Hamas, these allegations will not be analyzed. must choose appropriate means and methods of attack when military targets are located within residential areas. This requirement rules out the use of certain types of weapons and tactics. The use of weapons that are inherently indiscriminate such as unguided rockets is prohibited. And the use in densely populated areas of imprecise weapons that cannot be directed at a military objective with sufficient precision, such as mortars, is likely to result in indiscriminate attacks and is also prohibited. 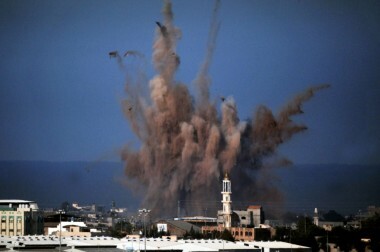 Setting aside that, unlike Israel, Hamas didn’t enjoy the luxury to “choose” its means and methods of attack, it is telling that Amnesty cites Hamas’s unguided rockets and its use of mortars in densely populated areas as “prohibited weapons,” but omits mention of Israel’s massive use of artillery shells in populated areas. It might be supposed that the omission was due to the fact that this report focused on Hamas war crimes. But, in the précis of international law complementing each of the two reports on Israeli crimes, Amnesty also passes over in silence the criminality of its artillery use. In “Strangling Necks,” Amnesty also accuses Hamas of having committed “war crimes” in its “torture” and “summary, extrajudicial executions” of “at least 23” alleged collaborators in Gaza. Because the focus of this monograph is Amnesty’s treatment of interactions between Israel and Hamas, these allegations will not be analyzed. Action on Armed Violence, Under Fire: Israel’s artillery policies scrutinized (2014). The artillery shells are doubly indiscriminate: they cannot be directed at, and their blast and fragmentation effects cannot be limited to, a specific target. An attack with a 155mm “Doher” howitzer is considered a “hit” if a shell lands within 46 meters of the target—a far cry from Amnesty’s “specific point target” standard and, anyhow, as the Breaking the Silence testimonies attest, the artillery was frequently fired with abandon—while the expected casualty-producing radius of each 155mm artillery shell is about 300 meters. 2014 Gaza Conflict purported that “in the overwhelming majority of cases” Israel fired high-explosive artillery shells into “open areas devoid of civilian presence” (para. 347; cf. paras. 354-57). But it also stated, “rather than utilizing the less populated areas of the Gaza Strip where they operate during lulls in hostilities,” Hamas had relocated its “assets and operations to built-up civilian areas in order to shield them from IDF attack” (para. 123; cf. p. 152n417). In other words, if this authoritative Israeli report is to be believed, Israel fired the overwhelming majority of 20,000 high-explosive artillery shells into empty spaces lacking military value. 2 Comments to "Has Amnesty International Lost Its Way? Part 7"
It’s OK Israel the world does not mind you using Sacrificial children for you to further you greater Israel agenda! Please continue as you wish! Why hasn’t Amnesty international ever considered “Penalizing” Israel for the” indiscriminate” nature of the Gazan’s’ “crude”rocket attacks ? After all…Aren’t the cruel restrictions and the siege as a whole what accounts for Gaza’s inability to purchase rocket launchers with anything more than”stone age” accuracy ? 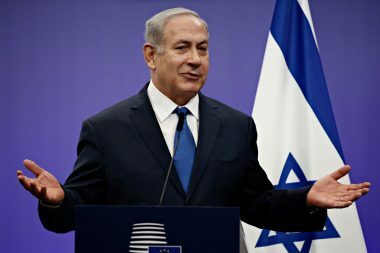 Shouldn’t Israel be hauled before the ICC on those charges first ? I mean come on . If Israel makes sure Gaza can only throw a “pebble”…why shouldn’t Israel be held account for the nature of that pebble’s” poor” trajectory ?